We were looking for 150+ hectares of commercial softwood plantation, with gentle topography and predominantly sandy soil. Obtaining planning consent for such a project would be extremely challenging (to say the least!) so we wanted to make things as easy as we could for ourselves. We would target areas of high potential housing-growth, and whilst we wouldn’t avoid designated greenbelt we would rule out land covered by other blanket planning designations. And ideally the site would currently be closed to public access, so there would be no loss of recreational amenity for the public. This entry was posted in Architecture/Design, Community Right to Build and tagged development, Forest Village, Forestry Commission, land-use, planning, Savills. Bookmark the permalink. 2 Responses to Forest Village #10: A Crowded Island? Your Forest Village concept is very thought provoking and reminds me a little of some Swedish suburbs I have seen where houses are built amongst the trees and there are few property demarcations. I have asked a old college friend of mine who lives in Stockholm if he knows of any developments over there that might be relevant to your concept. I think the whole topic of building in the countryside has been given a welcome shake up by Nick Boles. Though it pains me to praise a Tory I think he has been quite brave to raise this issue in such direct terms. He will no doubt feel the full ire of the CPRE/ National Trust lobby who don’t seem to be able to countenance the loss of a single tree or field. I agree with the slant of his argument that we need to challenge the view that the countryside is under mortal threat from housing development. The scaremongering put out by CPRE/ NT about concreting over the countryside needs to be countered with rational argument based on real data. Like you though I am far from comfortable with his vision of what that new development should be like. One report I read referred to Boles’ figures as 1500 sq miles supporting 2 million homes. This equates to a density of 5 dwellings per hectare which is alarmingly low. I think we need to re-discover some of the bold vision of the post war planners. Faced with a huge housing crisis they rose to the challenge with the New Towns movement. Today we are faced with a similar crisis and need solutions of a similar scale and ambition. Paternalistic central planning may have had its faults but it sure got things done. The subject of built land is one that I have looked in to and I thought I would share my findings. I notice on your one of your previous posts you refer to a figure of 13% for the proportion of built on land. Nick Boles refers to a figure of approximately 9%. 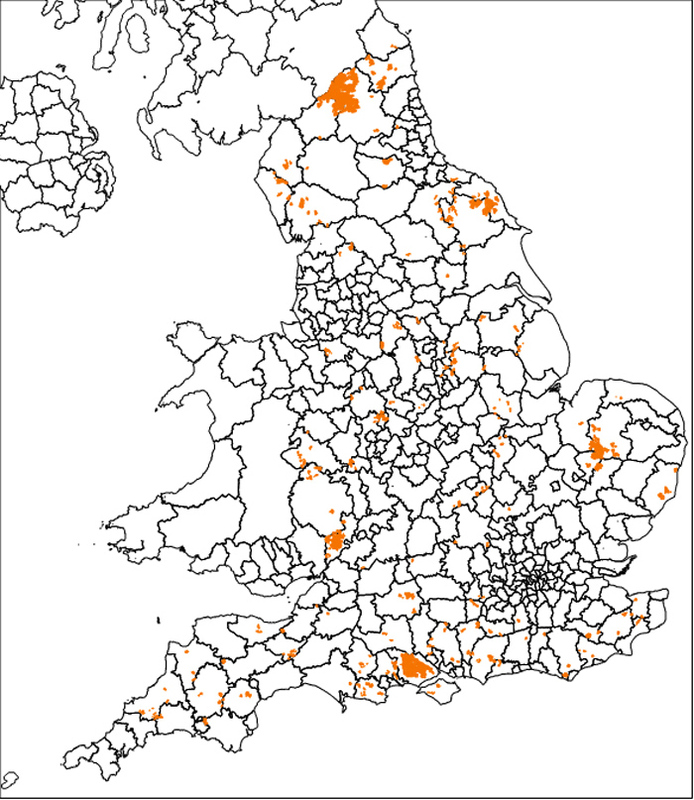 For what it’s worth I have done my own analysis based on the Land Use Database for England. I was unable to find one for the whole of the UK. This is a big excel file with all of the parishes in England broken down into ten categories of land use. It’s a fairly simple task to add them all up and it produces a figure of 9.93% which includes gardens. Strip out gardens and you get just 5.67%. It is reasonable to assume that these figures would be even lower for the UK after you have added all the sparsely populated areas of Scotland, Wales and N.I. Interestingly Mark Easton at the BBC blogged in June that according to the UK National Ecosystem Assessment the area of England that is built on excluding gardens and other natural areas is even lower at just 2.27%. I couldn’t find this figure in the report but which ever figure is right it is very low and gives the lie to the alarmist claims of the countryside lobby. I have tried to find comparable figures for other European countries and have only found a reference to Germany where the proportion of urban land (including gardens) is 13%. Germany is still a very green and rural country and shows that we could comfortably increase our area of urbanised land by 3% which is what Boles is suggesting. Anyway best of luck with the Forest Village project and keep up the good work with the blog. The numbers are interesting, and not what most people expect – but I certainly have some ambivalence about the whole discussion. I do think we need a proper co-ordinated strategy for accommodating (let’s say) 3 million new homes in UK over the next 20 years and it seems that the majority of these will have to be on previously undeveloped land. Forest Village is meant to be a contribution to the debate about how that might be done differently, and better, than we have managed in the recent past (see my post ‘More…But Not More of The Same’)…but I certainly don’t agree with an unrestricted push for green-field development. Look what happend to the Home Suburbs, sorry, I mean Home Counties, in the 1930s and 50s. Please do let me know if you can point me at any ‘real’ Forest Villages or suburbs elsewhere in the world. When we were working together on the project Yolande Barnes was sure she’d heard of similar developments in the Netherlands (maybe it was really Sweden), but I haven’t managed to find them on line.